Having a fab weekend? Hope so! In South Australia we have a public holiday on Monday for the racegoers to celebrate the Adelaide Cup horserace. So I'm going to work in the morning and get arty in the afternoon! We had our local art journal meet yesterday (Saturday). Loads of laughs and fun as usual :) Love my friends! 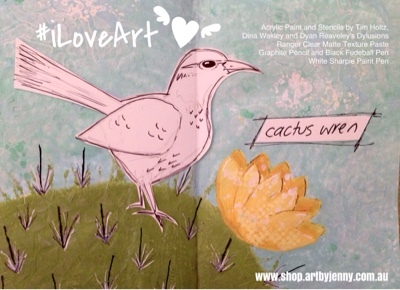 This is a page I created in Yvonne's book... Handdrawn Cactus Wren on Yupo paper on a background made with paint and texture paste. I used acrylic paint and stencils by Tim Holtz, Dina Wakley and Dyan Reaveley's Dylusions, Ranger clear matte texture paste, pencil, black Fudeball pen and white Sharpie paint pen. Distress paints are great for backgrounds, the colours blend well together! I used an mini ink blending tool to stencil with the white Dylusions paint and my fingers to stencil with the Distress paints. The texture paste I used a spatula. 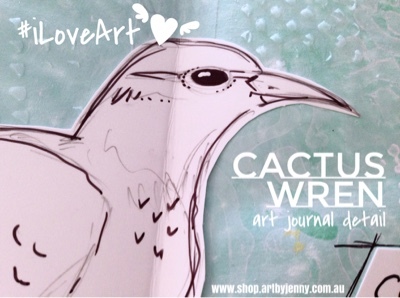 Have you ever wanted to have a go art art journaling but don't know where to start? I can help you - with supplies as well as lessons :) I'm in southern beachside Adelaide, SA. Contact me via FB pm or my shop at www.shop.artbyjenny.com.au.